30.5 cm (12”) circumference X 47.5cm (18.75”) long. Christmas in the Pacific Northwest doesn’t always match up to the snowy wonderland you see on TV specials. However, we do get a dusting down by the water every once in a while, and we have our share of fantastic winter resorts. 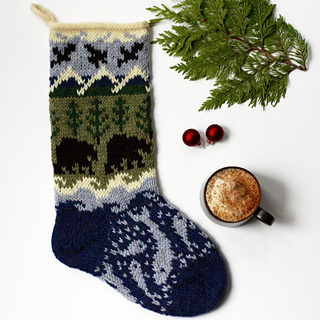 This stocking was designed for those of us who prefer the Pacific Northwest’s blue, green and grey over red and green. The stranded motifs feature whales, waves, bears, trees, mountains, eagles and a cloudy sky. There are some long floats involved, so this pattern may be best suited to a knitter who is comfortable with their stranding tension. The stockings are worked toe-up with a solid colour toe and a stranded foot. Prepare for an after-thought heel, add the stranded leg patterning and finish the top of the stocking with a i-cord bind-off and loop for hanging. Then finish the solid afterthought heel with Kitchener stitch. Pattern does not include detailed instructions for a toe up cast on. Knitty has a great tutorial for Judy’s Magic Cast On. Yarn: Knit Picks Wool of the Andes (100% wool; 110y/100m, 50g/1.75oz) in 6 colours (1 ball each): 25649 Delft Heather (MC), 23898 Lake Ice Heather (C1), 23432 Cloud (C2), 24074 Pampas Heather (C3), 24652 Bittersweet Heather (C4), and 23897 Forest Heather (C5). scrap yarn; and tapestry needle. 20 sts/ 21rows = 10cm/4” in stranded stockinette with larger needles in the round.